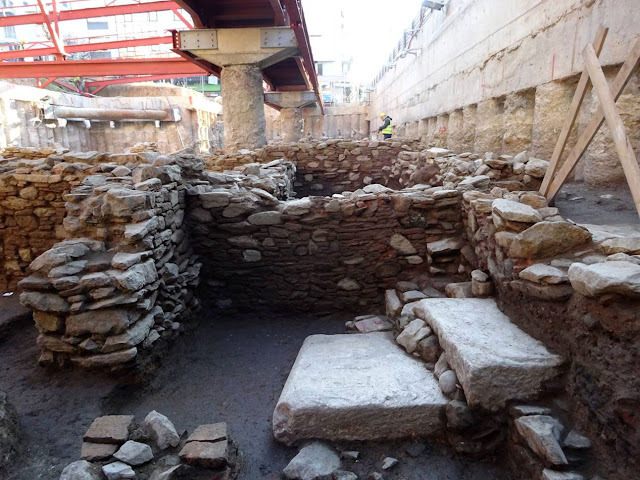 The remains of a marble-paved market square, enclosed by a circular S-shaped stoa, were revealed during the archaeological investigations at the entrances of Thessaloniki’s metro station “Aghia Sofia”, which is under construction. 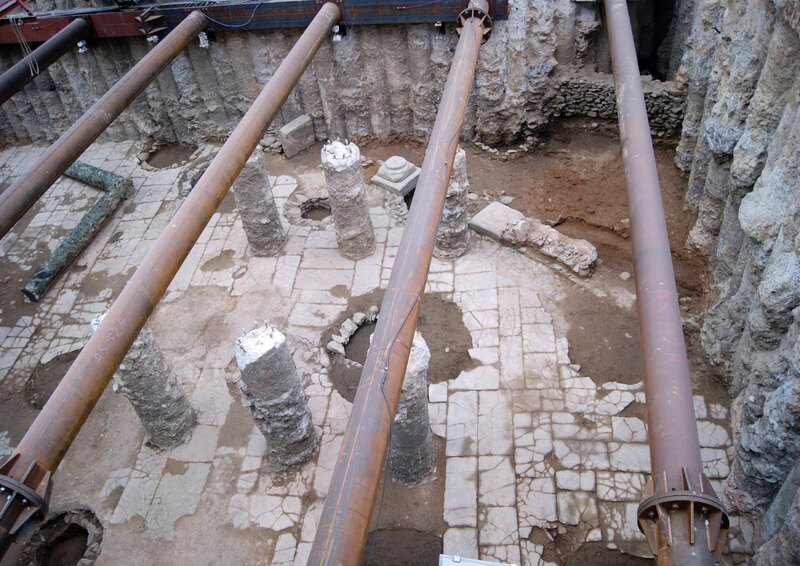 The monumental complex, at the junction of the main Roman road “Decumanus Maximus” and the “cardo” of Aghia Sofia, is located on the axis of two important Early Christian monuments, the Basilica of Acheiropoietos and the Episcopal Basilica at the site of the Aghia Sofia church. 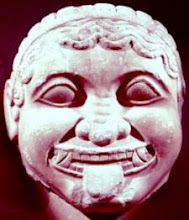 It dates to the 6th century. The first results of the excavation research, conducted by the Ephorate of Antiquities of Thessaloniki City, were presented by archaeologist Eleni Lambrothanasi at the 30th scientific meeting about the excavations in Macedonia and Thrace, which was organized by the Aristotle University of Thessaloniki and the Ministry of Culture. “These monumental arrangements of public space, integrated in large-scale building programmes, are dated back to the 5th and 6th centuries and were in use (…) at least up to the 9th century. 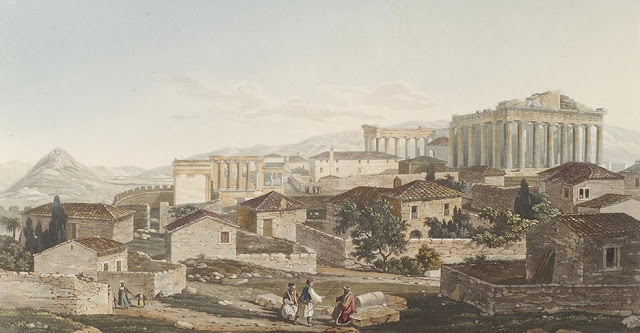 Similar arrangements of public spaces along main roads were implemented as big building programmes of emperors during the 4th, 5th and 6th centuries in Constantinople. 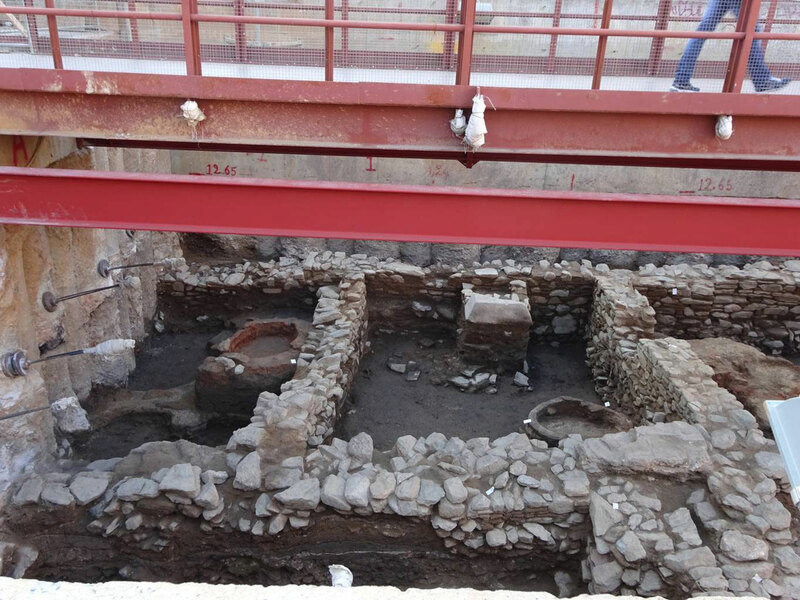 These are known from the sources” Mrs. Lambrothanasi pointed out, stressing that “in Thessaloniki the new urban planning programme of Early-Christian years with the semi-circular S-shaped places extends upon previous built isles”. “During the Proto-Byzantine years we notice a clear differentiation in urban planning. The Byzantine market with its shops and workshops occupies part of the public land. […] The succession of buildings within a broad chronological horizon, which spans from Late Antiquity to the Byzantine era, is indicative of the continuity of public everyday life of the city”, the archaeologist explained. 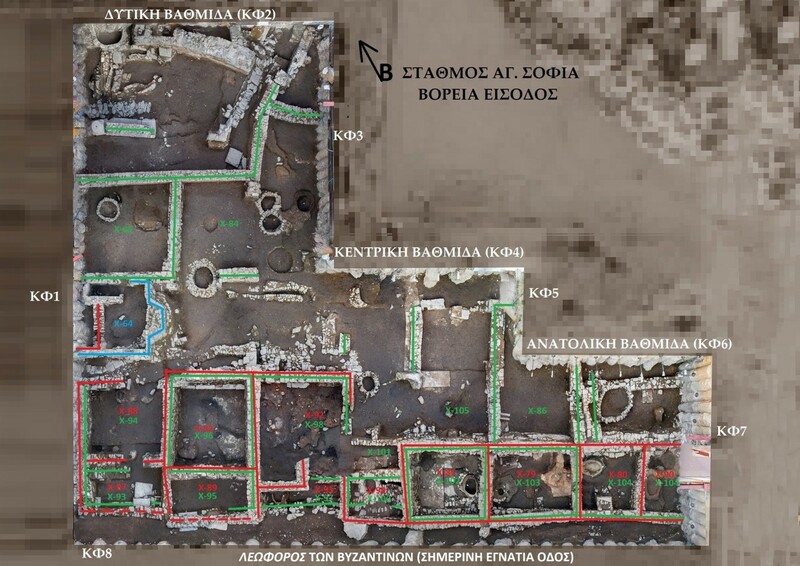 North of the “Decumanus Maximus” there is a market square enclosed by a circular S-shaped stoa-platform. It is estimated that it used to cover a surface of 300 square metres. 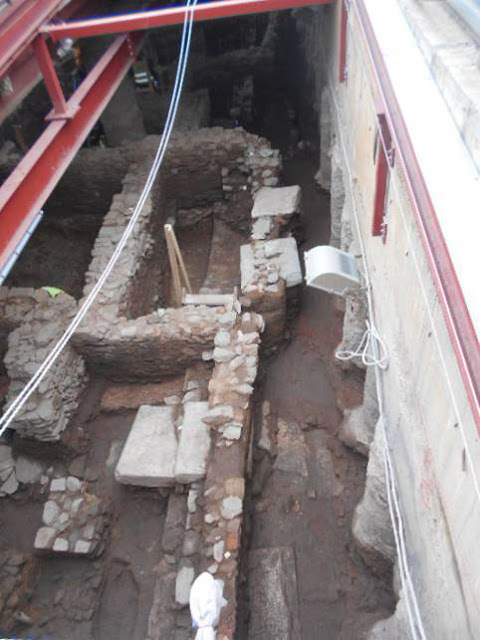 Within the large trench the eastern half of the square (190 square metres) was revealed. Two doorways in a wall lead to the north and northeast, possibly to a third concentric part of the porticoed building, which, as archaeologists assume, hosted shops. Although the linking of the square with the Decumanus Maximus is not absolutely clear, due to the Byzantine-era walls built in later periods, archaeologists believe that the square is connected to the main road by a stoa, running parallel to the square and stretching only to the width of its opening. 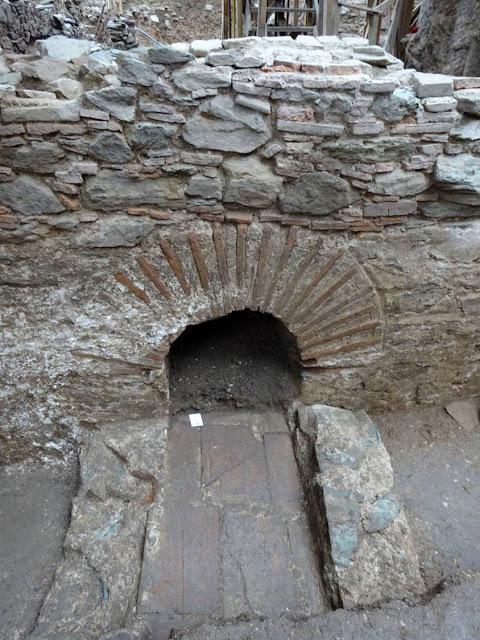 The two stylobates with crowning of marble slabs are barely visible underneath the walls of the Byzantine shops. A similar arrangement can be seen at the south junction of the Decumanus Maximus with the “cardo”, where the semi-circular square opens to the vertical road axis. Parts of the walls and the stylobates were located in the trench of the southern part of the subway station. 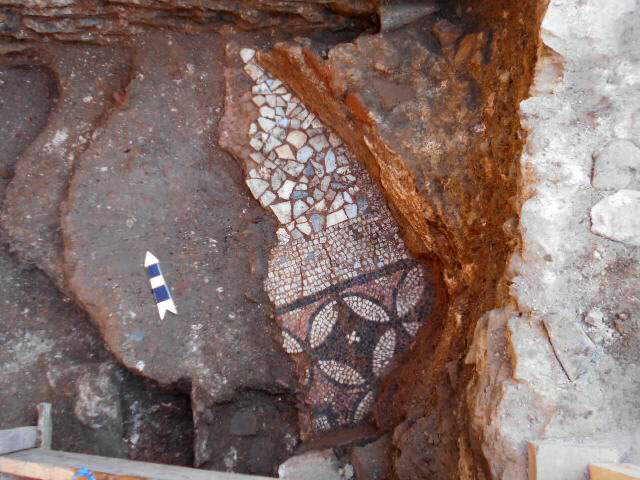 Fragments of wall mosaics and paintings “prove” the luxurious decoration of the stoa vaults. 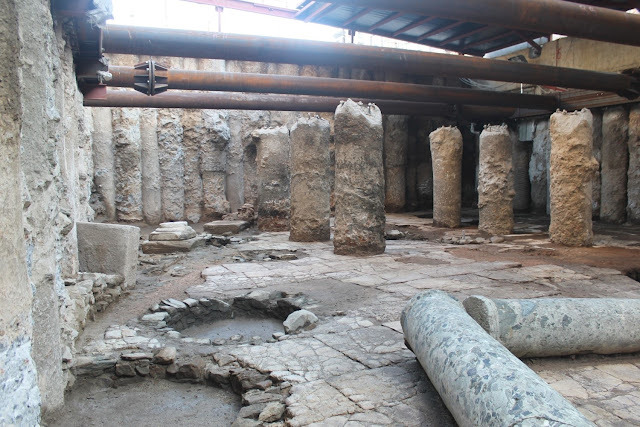 On this side, the square was also covered by marble slabs, although the biggest part of the floor has been destroyed, and the slabs preserved in situ are broken into pieces. The paved surface is estimated to cover 296 square metres.